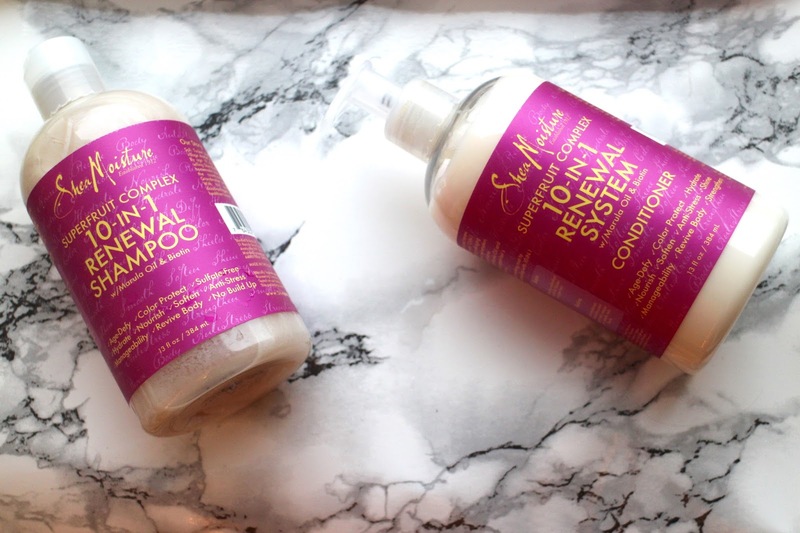 Let me introduce you to the two products that have helped completely revive my hair over the last few months. I honestly wasn't holding out much hope for the Shea Moisture* 'Superfruit Complex' shampoo or conditioner when they were sent to me. I had never heard of them before I was contacted but I was instantly intrigued by the supposed '10 in 1' things that each bottle helps against. I had dry, colored hair that looked flat and completely lifeless. I had blonde in my hair that completely sucked the life out of the ends of it. So much so that when I went to the salon to revert back to my brunette locks, my hair was so dry and fragile that it knotted together and took the patience of my hairdresser to unravel. SO embarrassing. Ever since that humiliating hairdresser visit I've been using this shampoo and conditioner from Shea Moisture. I was determined to bring my hair back to life and I have done. My hairdresser commented when I went in a few weeks ago that my hair looked and felt so much better and it had a lovely shine off of it. All done to this shampoo and conditioner my friends because I changed nothing else. I don't have too much to say on these, I mean they're a shampoo and conditioner with big claims, and they deliver. The shampoo - I expected it to smell kind of coconutty, but it was more fruity than anything else. I found that there was more of the scent on my hair when it dried than there was when I was washing it. It was hard to make out any sort of scent really, but when your hair dries, ahhh it smells so good. I found it really hard to get a good lather from this shampoo, you really have to use quite a bit of the product which was annoying because I felt like I was wasting a lot of it. IT also stays true to it's claims and doesn't build up on your hair. A nice change from the usual shampoos I use, especially since clarifying shampoos are so expensive. The conditioner - this was weird because it felt more like a mask than a conditioner? It's quite thick and a little pump really goes a long way, unlike the shampoo. I applied this to the ends of my hair post shampoo and brushed it through with a tangle teezer. I left it for the length of my shower and then rinsed. I found it hard to get off the ends of my hair because it was quite thick but it left my hair feeling so soft and shiny that I really can't complain. I do recommend using both these products together, they really compliment one another and I found switching out the shampoo for another shampoo didn't leave my hair feeling half as nice as when I used both the 'Superfruit Complex' products together. Right now my hair feels and looks so much better than it has in a long time and I owe it all to these guys. It smells so good too. They're also 100% cruelty free. Have any of you tried these? What did you think? Great review! I have to be honest I got mixed feelings about these prodects when reading this review. but none the less will give them a try.